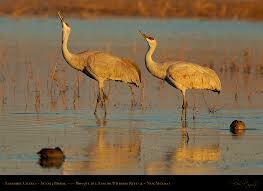 Beginning about mid-November in our area, flocks of Sandhill Cranes can be seen migrating south. Travelling on silvery wings in the familiar ‘V’ formation, they are frequently confused as Canadian Geese. However, Geese are content to stay in place in this region and don’t trouble themselves with migration. A primary identification for Geese is that they fly at relatively low altitudes and have that distinct, nasally-honking sound. Cranes are usually seen much higher and have a sort of guttural, rolling call that, to me, sounds pre-historic. 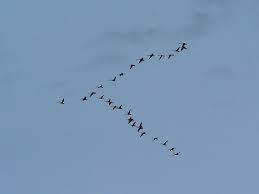 As the lead bird in the ‘V’ tends to work the hardest, flocks can be seen milling about aimlessly while another bird is chosen to take the point. At least half the time when I hear Sandhills I don’t see them as trees tend to obscure their flight, particularly if their path is low on the horizon. Regardless, their calls and their movement through the sky stirs something deep within me. It’s a spiritual resonance with one of Nature’s creatures that gives me hope that their kind of life will continue to endure as they have already for millions of years. From what I understand, the largest populations are in the mid-West with the Mississippi River representing a primary flyway for spring and fall migrations. The birds we see (sometimes flocks can number in the hundreds) are moving out of their summer breeding grounds in northern Michigan, Minnesota, Wisconsin, and Canada. My understanding is that there are now populations that over winter on reservoirs in eastern Tennessee and western North Carolina. However, my contact with this magnificent creature has been in the Okefenokee Swamp in south Georgia. They are huge birds with a wing span over six feet and a height of almost four feet. When I’ve seen them while canoeing in the Swamp, their heads were on eye level with me even though they were standing in almost a foot or more of swamp water. Most of the populations of Sandhills are doing alright, but their close cousin, the Whooping Crane, almost became extinct as its plumage was highly coveted for hats and millinery more than one hundred years ago. There are now about 200+ ‘Whoopers’ left. I saw a pair of them near Hayesville, N.C. last year where they decided to take up winter residence alongside a larger number of Sandhills. To me, Sandhills seem to spend a good bit of their life on the wing as it won’t be too long before groups of them will be visible heading back north. In our area, this can begin in mid-January, but they are certainly in full transit a month later. If you’re not familiar with them, watch the skies on clear cerulean days, and listen for their distinctive calls. See if these magnificent creatures have the same impact on your heart and soul that they do on mine!